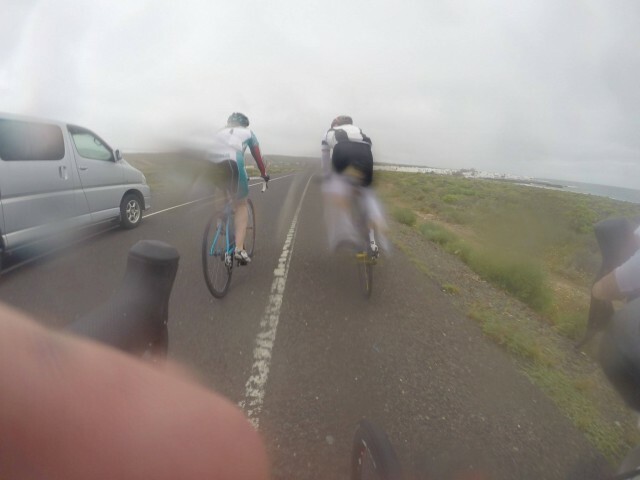 In all my trips to Lanzarote I can’t recall ever riding in as much rain and drizzle as I did yesterday. Of course, it was still better than conditions back home – snow I hear – but it’s not really what you come to Lanzarote for. The wind is expected, rain and fog not so much. Keen to run a smooth and efficient camp I’d insisted that, unlike Sunday, there would be a prompt 9am departure on Monday morning. No stopping, waiting or faffing. My demands were met and everyone was waiting for me when I arrived at the front (just after 9). Then, before we’d even left, a puncture. So much for the prompt start. As I stood shivering in the wind and rain it occurred to me my kit might not be up to today’s ride. So while the group waited for Michal to replace his tube I popped back to the room for some warmer layers. My first lesson of the day: don’t try to ride on slippery tiles or you may come into quick contact with the ground. More suitably dressed with the addition of knee warmers and a rain jacket I returned to the front with time to spare. It wasn’t the quickest repair. The group rolled out at 9:15; an improvement on Sunday’s effort. 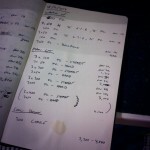 We left town together – no loses today – and split into two groups heading north into constant headwinds and rain. The rain was unpleasant enough, but by Orzola, at the far end of the island, it was clear the dense cloud and fog shrouding Mirador del Rio was a more serious issue. I didn’t want to lead the group into such poor visibility; a change of plan was required. Most of Lanzarote’s ascents are gradual and into the wind, but the climb out of Orzola has a few steep patches and tends to be sheltered. After the first 5K you have a choice: turn right and continue up to Mirador del Rio or turn left and enjoy the sweeping descent to Arrieta. 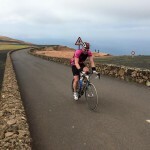 Given the circumstances our group took the latter option – a not particularly enjoyable rain swept descent. Again, while the rain was unpleasant enough, for Frankie a tyre blow out on the final straight was a more serious issue. Thankfully she held it together (apparently there was a scream) and brought her bike to a safe stop at the side of the road. How many cyclist does it take to repair a puncture? The correct answer is six; plus a section of toothpaste tube, 3 inner tubes, 3 different hand pumps, 2 canisters of CO2 and roughly 30 minutes of work. There was much labour involved in the repair not helped by faulty inner tubes and ineffective hand pumps. At least the wind – and rain – was behind us when we finally headed home. After all that excitement I was glad for the afternoon off. A few hours to relax, then at 6pm a solid 3.4K swim (below) as the sun sets; a good way to work up an appetite for dinner. Once everyone had warmed up I did some technique work with one or two swimmers while David managed timings and pacing in the other lanes. My second lesson of the day was more positive: my new iPhone 6 is great for giving swimmers feedback with short, high quality videos of their swim. 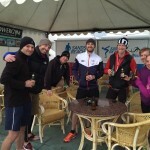 After all that – dinner and an early night ready to tackle the Ironman course in high winds. 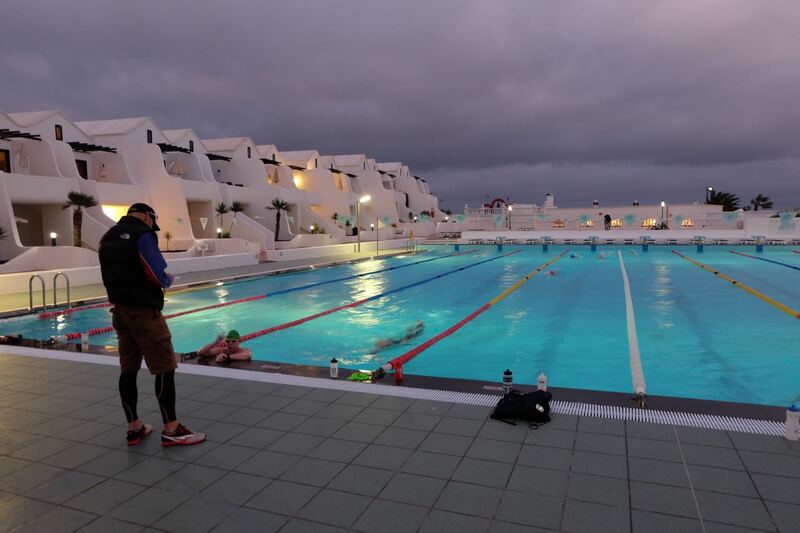 Lanzarote Camp Day 6 – Week One Done!